Discussion in 'OtherWoods' started by Mayavi 369, Feb 17, 2016. Grossed 5.85 Cr in 38 Days..
Actor Sivakarthikeyan’s latest release Remo has exceeded the expectations in terms of its worldwide box office collection. According to the industry trackers, the film’s worldwide opening weekend collection now stands at Rs 33 crore. According to reports, in three days the film has collected Rs 21.5 crore in the domestic market, and has earned Rs 11.5 crore in its overseas market. According to the box office break up provided by trade tracker Ramesh Bala, Remo has grossed A$103,808 (Rs 52.5 lakh) in Australia, $152K (Rs 1.01 crore) in the US, £47K (Rs 39 lakh) in the UK and 23K € (Rs 17 lakh) in France. The film has also earned Rs 1.15 crore in Malaysia and another Rs 1.15 cr in UAE. The film, meanwhile, which faced heavy competition in Kerala from Pulimurugan, Thoppil Joppan and Dev(L), has reportedly managed Rs 43.2 lakh in box office collection. 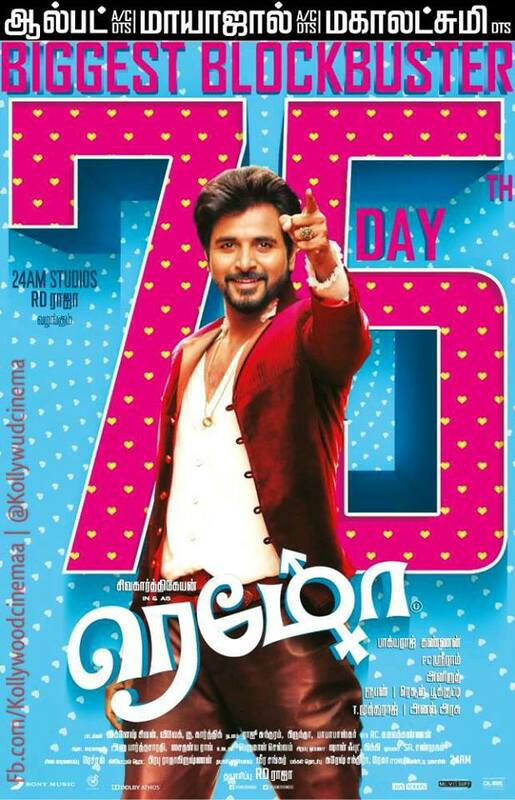 Distributors and theatre owners spoke to me.confirms 100% occupancy All over.everybody makes profits.overflow comes to everyone.SO HAPPY,” tweeted R D Raja of 24 AM Studio, which bankrolled Remo film. “#Remo grabs the No.3 spot this year in TN opening weekend gross, behind just Kabali and Theri.. The rise and rise of @Siva_Kartikeyan,” tweeted Kaushik LM, a film reporter. “#Remo will be @Siva_Kartikeyan ‘s best ever BO in #Vettri .The emerged family hero has now upgraded his hit standard to next level. Way2Go!” tweeted Rakesh Gowthaman of Vettri Theatre in Chennai. While the opening weekend box office numbers of Devi(L) are yet to revealed by the makers, the trade pundits have suggested that the film has witnessed steady business growth due to a positive word of mouth.